The Pigeon River Country State Forest is a rugged 105,049-acre tract located 20 miles north of Gaylord and occupying the high central plateau of the Lower Peninsula. The forest is an outdoor playground crisscrossed with dirt roads, old two-tracks, and trails and dotted with lakes, trout streams and eight campgrounds, small rustic facilities tucked away on river bends and isolated lakes. Its best known as the home of the Michigan elk herd, an animal that was reintroduced here in 1918. Click Here to order a detailed map of the main trails in Pigeon River Country State Forest. 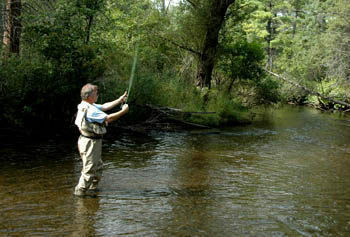 The Pigeon River Country State Forest is a rugged 105,049-acre tract located 20 miles north of Gaylord and occupying the high central plateau of the Lower Peninsula. The forest is an outdoor playground crisscrossed with dirt roads, old two-tracks, and trails and dotted with lakes, trout streams and eight campgrounds, small rustic facilities tucked away on river bends and isolated lakes. It’s best known as the home of the Michigan elk herd, an animal that was reintroduced here in 1918. Beginning and ending in the state forest is the High Country Pathway, a 70-mile loop that passes through four counties and the heart of Michigan's Northern Lower Peninsula. Most backpackers need five to seven days to hike the entire circuit. But for those who don’t have the time or the inclination to hike that far, there are many trail options in the state forest that are just as scenic but much shorter. Green Timbers includes a 3.5-mile route to a wonderful, free-use cabin perched on the edge of a ridge overlooking the Sturgeon River valley. Shingle Mill Pathway is a trail system composed of five loops including a 6-, 10- and 11-mile loop with portions winding along the Pigeon River. Shingle Mile is open to hikers and mountain bikers while during the winter it becomes a popular wilderness outing for backcountry Nordic skiers. Even shorter is Pickerel Lake Pathway, a 2-mile loop that conveniently begins and ends at Pickerel Lake State Forest Campground. From Town Corner Lake Campground you can follow the High Country Pathway north 2 miles to reach the Old Fire Tower or combine it with a stretch of Tin Shanty Road and Chandler Dam Road for a mountain bike outing of 5.7 miles. In 1985, Pigeon River Country was selected as the first place to reintroduce the pine marten in the Lower Peninsula. Other wildlife species that thrive here include black bear, bobcat, coyote, otters, grouse, woodcock and bald eagles. But all take a backseat to the elk. Although a few live to 20 years of age, most elk have a lifespan of under 10 years. Grasses and plants are the main food source for elk but during deep snow cover they will browse on twigs and stems of trees and shrubs. An adult can easily consume 25 pounds of grasses and plants during a day or three times the consumption of an average adult deer. Nor are elk as susceptible to winter starvation as deer. Their huge build, generally four times the size of a trophy buck, makes then far less restricted by heavy snow. Calves are born in late May and early June with twins being rare. The new born will weight 20 to 30 pounds at birth and its mother will stay away from other elk until the calf is two to three weeks old. At that point cows, young bulls and calves concentrate into large groups and often a few cows will baby-sit as many as 20 calves with their mothers go off to graze. Bulls grow their antlers every spring, drop them by the following March and April and for the most part spend their summer in small groups of five or six. By August they begin polishing their antlers for the rut of September when they form harems for the breeding season, gathering 15 to 20 cows and some times as many as 30. Dominant bulls drive off their weaker opponents with an aggressive manner and using a low whistling sound to challenge them or mark their territories. The mating call is the season of bugling in northern Michigan and it's the reason thousands of elk watchers arrive at Pigeon River Country every fall. Although elk can be sighted any time of the year, during the summer they head for the thick underbrush of the forest to escape the heat and in the winter they gravitate to logging operations and clear cut areas where they can find an abundance of young woody sprouts. The prime time for viewing elk is when bull bugle to form harems from early September through mid-October. 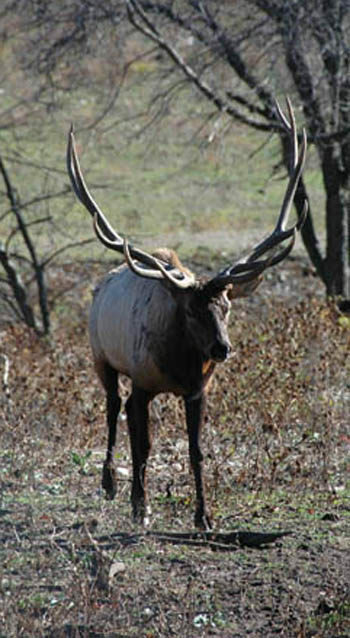 Wildlife enthusiasts can pick up an Elk Viewing Map from the state forest headquarters that will show the best places to spot one during the bugling season. There are eight rustic campgrounds in the Pigeon River Country State Forest with two them, Elk Hill Trail Camp and Johnson’s Crossing Trail Camp, serving equestrians and their horses. 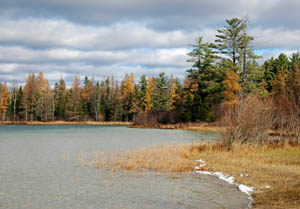 Connected to the High Country Pathway are Pine Grove (6 sites) Pigeon Bridge (10 sites), Round Lake (10 sites) and Town Corner Lake (12 sites). 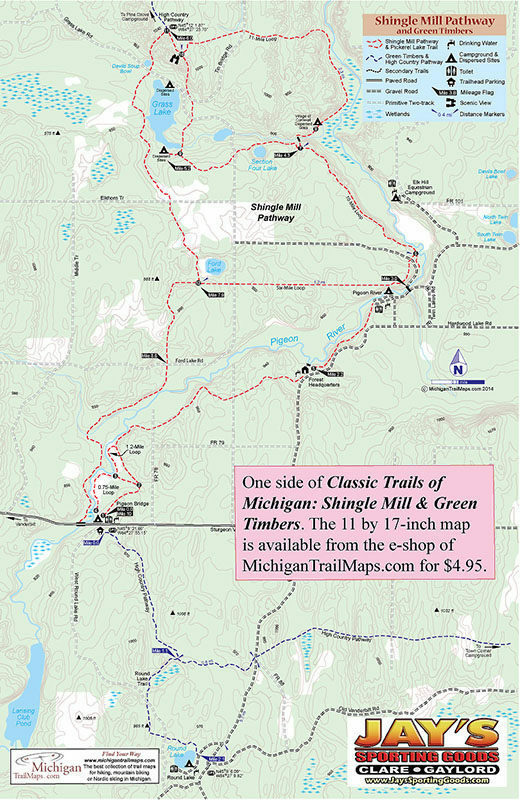 The Shingle Mill Pathway passes through Pigeon River State forest Campground (19 sites) while the largest campground in the state forest is Pickerel Lake (39 sites). 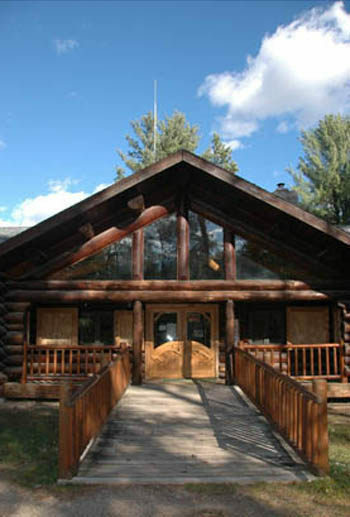 The Pigeon River Country State Forest Headquarters (989-983-4101) is open 8 a.m. to 5 p.m. Monday through Friday. A state park recreation passport may be required at some trailheads and at all designated campgrounds. There is also a nightly fee to stay in the rustic campgrounds. From I-75 depart at exit 290 and head south for Vanderbilt. In town turn east (left) on Sturgeon Valley Road and follow it for 11 miles. The Pigeon Bridge State Forest Campground is reached just after crossing the Pigeon River. To reach the state forest headquarters continue east on Sturgeon Valley Road another 3 miles and then turn north (left) on Twin Lakes Road. The headquarters is passed in a mile, and Pigeon River State Forest Campground is reached in 2 miles.